After a succession of political setbacks in onetime strongholds and a landmark defeat in the Supreme Court, organized labor has notched a hard-won victory as Missouri voters overrode a legislative move to curb union power. The victory in Missouri aligns with other tentative signs of a labor revival. Among them are polls showing rising popular support for unions and an uptick in membership in teachers’ unions after walkouts in several states during the past school year. 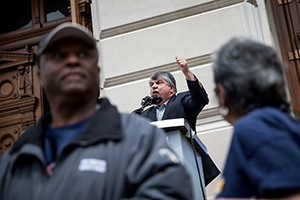 The examples of Michigan and Indiana, where right-to-work laws took effect earlier this decade, suggest that the legislation could have cost unions thousands of members and millions in revenue. One question is the extent to which the victory could reverberate beyond Missouri. Mr. Greitens had signed a right-to-work bill into law after the legislature passed it in early 2017. Supporters argued that the measure was essential to the state’s economic competitiveness. “Companies that have a choice of expanding or choosing where they locate to begin with, they will generally choose — especially in the manufacturing sector — a right-to-work state,” said Daniel Mehan, president and chief executive of the Missouri Chamber of Commerce and Industry. He cited the manufacturing boom in the South in recent decades as a key data point. But shortly after the law’s passage, unions and their allies in the state started a campaign to keep it from taking effect. They submitted about three times the roughly 100,000 required signatures by last August, setting up the statewide ballot vote, then began aggressively campaigning this spring for a “no” vote — that is, a reversal of the legislative move. “I’ve been out knocking on doors, walking, since the middle of May,” said Mark Staffne, an electrical construction mechanic and union member, who lives in St. Charles County, which is heavily Republican. Labor groups characterized right-to-work laws as an attack on workers’ livelihoods, because, they said, they undermine unions’ ability to negotiate wages and benefits. A 2015 report by the liberal Economic Policy Institute found that the typical full-time worker, not just the typical union member, earned about $1,500 per year more in states where mandatory union fees are allowed than in right-to-work states. These arguments appeared to resonate in Missouri, but Janice Fine, a professor of labor studies at Rutgers University, wondered whether the tendency of many unions to define their relationship with workers in narrow economic terms may be accelerating labor’s decline over the long run. An overly transactional relationship might prove less compelling if workers feel they can spend their money better elsewhere — say, by joining a bowling league or a gym. The alternative would be to cultivate more of a philosophical commitment, making unions more akin to evangelical churches, albeit in the secular realm. “I feel so ambivalent about that whole argument,” Ms. Fine said, referring to the free-rider case against right-to-work laws.